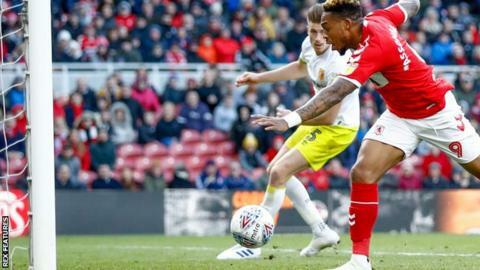 Britt Assombalonga's goal was enough to move Middlesbrough back within a point of the Championship play-off places as they damaged Hull's own top-six bid. The hosts opened the scoring after 25 minutes when forward Assombalonga tapped in Ashley Fletcher's low cross. The Democratic Republic of the Congo international came close to doubling Boro's lead just before half-time, striking an effort against the crossbar. Hull winger Kamil Grosicki saw his free-kick tipped on to the bar by home keeper Darren Randolph in injury time as Middlesbrough held on for all three points. Middlesbrough had lost six of their past seven Championship fixtures and could have gone behind in the first half when Grosicki saw his shot well saved by Randolph. But, once they went ahead, Tony Pulis' team looked the better side and nearly doubled their lead moments after Assombalonga's opener but George Saville failed to bundle in Fletcher's looping header at the far post. City keeper David Marshall made a number of crucial saves, parrying away Saville's curling free-kick midway through the first period and blocking a Fletcher effort in the 68th minute. Hull striker Fraizer Campbell twice nearly equalised, heading Jarrod Bowen's cross narrowly wide before slicing a shot off target, while Grosicki saw his chip cleared off the line by John Obi Mikel with 12 minutes remaining before being denied by the woodwork late on. The result means Middlesbrough are seventh, a point behind sixth-placed Bristol City, who have a game in hand, while Hull remain ninth, five points off the top six. "I just think again it's déjà vu. The chances we had first half, we should be scoring more than the one goal. "If it's just the one goal, it's going to be edgy all the way through and that's the way it was. "I think we had seven chances today where if we beat the goalkeeper, we score. "We are obviously pleased with the result. I'm really, really pleased, they had to dig in and they did dig in." "How have we not won the game? "We had some good opportunities in the first half, but second half we totally dominated the game. "I think the referee is going to go to the very top of the game - he has to see that penalty on Frazier Campbell. "It's the clearest penalty he's ever going to see in his career and he's not given it and that could have changed the game. How the four officials cannot give that is beyond me. "You cannot fault the players' effort and commitment and desire. Unfortunately we haven't got the result we've come for." Match ends, Middlesbrough 1, Hull City 0. Second Half ends, Middlesbrough 1, Hull City 0. Attempt saved. Kamil Grosicki (Hull City) right footed shot from the left side of the box is saved in the centre of the goal. Assisted by Jackson Irvine with a cross. Attempt saved. Kamil Grosicki (Hull City) right footed shot from outside the box is saved in the top right corner. Daniel Batty (Hull City) wins a free kick in the attacking half. Daniel Batty (Hull City) wins a free kick on the right wing. Attempt missed. Britt Assombalonga (Middlesbrough) right footed shot from the centre of the box is close, but misses to the right. Substitution, Hull City. Daniel Batty replaces Jordy de Wijs. Attempt missed. Aden Flint (Middlesbrough) header from the left side of the box is high and wide to the left. Assisted by Adam Clayton following a set piece situation. Britt Assombalonga (Middlesbrough) wins a free kick in the attacking half. Attempt missed. Jarrod Bowen (Hull City) left footed shot from outside the box misses to the left following a corner. Corner, Hull City. Conceded by Ashley Fletcher. Attempt blocked. Chris Martin (Hull City) left footed shot from the centre of the box is blocked. Assisted by Kamil Grosicki. Attempt missed. Kamil Grosicki (Hull City) right footed shot from the centre of the box misses to the left following a corner. Attempt blocked. Jordy de Wijs (Hull City) left footed shot from the centre of the box is blocked. Assisted by Markus Henriksen. Attempt blocked. Kamil Grosicki (Hull City) right footed shot from the left side of the box is blocked. Assisted by Reece Burke with a headed pass. Substitution, Hull City. Evandro replaces Todd Kane. Attempt blocked. Jonny Howson (Middlesbrough) right footed shot from outside the box is blocked. Assisted by John Obi Mikel. Attempt missed. Fraizer Campbell (Hull City) right footed shot from the centre of the box misses to the left. Assisted by Jarrod Bowen. Attempt saved. Ashley Fletcher (Middlesbrough) right footed shot from very close range is saved in the centre of the goal. Assisted by Jonny Howson with a cross. Substitution, Hull City. Chris Martin replaces Marc Pugh. David Marshall (Hull City) wins a free kick in the defensive half. Foul by Dael Fry (Middlesbrough). Corner, Middlesbrough. Conceded by Eric Lichaj. Attempt missed. Fraizer Campbell (Hull City) header from the left side of the six yard box is close, but misses to the left. Assisted by Jarrod Bowen with a cross following a corner.